The Fountain Square, located at the intersection of Sherman Avenue, Orrington Avenue and Davis Street. Next week, the city will begin a major renovation project to improve the Fountain Square area. 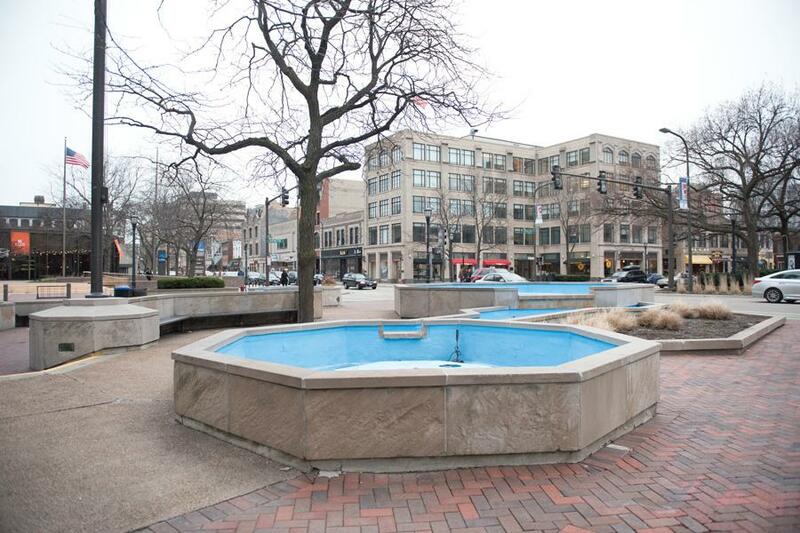 After years of planning, Evanston will kick off its Fountain Square renovations next week with an estimated completion date for the end of the year. The project, which has been in the works for at least two years, will cost about $6.6 million and begin on April 3 with sidewalk replacements, Public Works director Dave Stoneback said. The renovations — which will roughly double the size of the triangular median south of Davis Street — will turn the fountain area into a mini park, with outdoor furniture and new landscaping. Construction will occur in four phases, leading up to the project’s completion in December. The new Fountain Square area will include several modernizing amenities that will transform it into a central hub for Evanston residents, Stoneback said. Among the changes is a more decorative fountain, which will have water spouts that are level with the sidewalk. The fountain will also feature computer-controlled jets and shifting colors that will change with the seasons, Stoneback said. Rendering of the completed Fountain Square renovations. To make the square more enticing, Stoneback said festoon lighting — trendy bulbs that hang from string or wire — would replace the current light poles. The poles will be moved to the triangular median south of Davis Street, currently occupied by foliage and shrubbery. Construction workers will demolish two lanes of road to roughly double the size of that triangular median, turning it into a more accessible gathering place. Stoneback said the median will also include outdoor furniture, a small grassy area and permanent evergreen trees so the city doesn’t have to cut one down for Christmas. Stoneback said the space would become a “more modern multi-use space for all residents of Evanston,” improving on an antiquated design. The current square — which is located at the intersection of Sherman Avenue, Orrington Avenue and Davis Street — houses a more than 40-year-old fountain that is beginning to deteriorate. In addition, Stoneback said the existing fountains don’t work properly and Veteran’s Memorial is hard to read. As a result, city officials began looking into renovations more than two years ago and approved nearly $5 million in funding in October 2015. The project will be funded in part through tax increment financing, money collected through taxes by the city for public works. The remaining money will come from the General Obligation Funds for Capital Improvement Projects. After workers complete Phase One — replacing sidewalks on Sherman Avenue, Orrington Avenue and Davis Street — around May 1, they will begin to demolish the current fountain and block off the area surrounding the square, resident engineer Tracy Wais said. Demolition work and sidewalk replacements will continue throughout the project. Construction is scheduled to end by Dec. 1, but Wais said there would be about a week of final touches following completion. She added the timetable may shift up to a month due to inclement weather.